Battle Honour ST QUENTIN - German Spring Offensive 1918. Third Battle of the Aisne, German Blücher-Yorck Offensive. Edmund, son of Arthur and Margaret Jane De Wind, was born in Comber, Co Down, Ireland on 11 December 1883. He attended Campbell College before working for the Bank of Ireland and later emigrated to Canada. 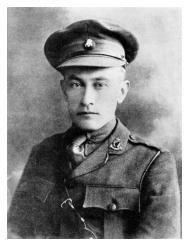 He was working for the Canadian Bank of Commerce in Edmonton when he enlisted into the 31st Battalion (Alberta), Canadian Expeditionary Force (CEF) on 16 November 1914. He fought with the CEF at St Eloi, Ypres and the Somme. He was discharged as a Private on 23 September, following officer cadet training in England, and commissioned into The Royal Irish Rifles on 26 September 1917. For most conspicuous bravery and self-sacrifice on the 21st March 1918, at the Race Course Redoubt, near Grugies. For seven hours he held this most important post, and though twice wounded and practically single-handed, he maintained his position until another section could be got to his help. On two occasions, with two NCO's only, he got out on top under heavy machine gun and rifle fire, and cleared the enemy out of the trench, killing many. He continued to repel attack after attack until he was mortally wounded and collapsed. His valour, self-sacrifice and example were of the highest order. His body was never recovered, and he is remembered on the Pozieres Memorial at the Somme. King George V presented Edmund’s mother with his Victoria Cross at Buckingham Palace on 21 June 1919 as Arthur, his father had died in 1917. 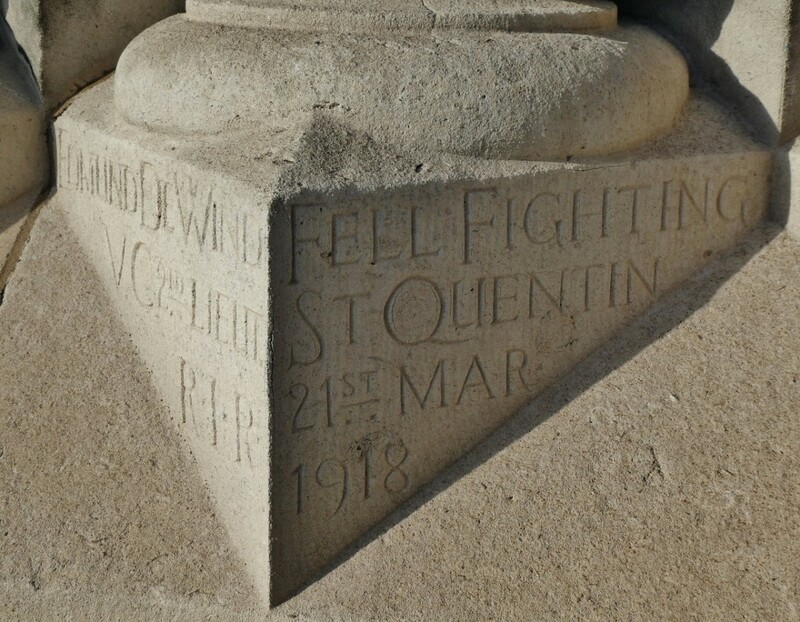 His name can be seen on the foot of a pillar at the west front of St Anne's Cathedral in Belfast (above left), a dedication by his mother, and Mount de Wind in the Canadian province of Alberta was named in honour of his valour and supreme sacrifice. 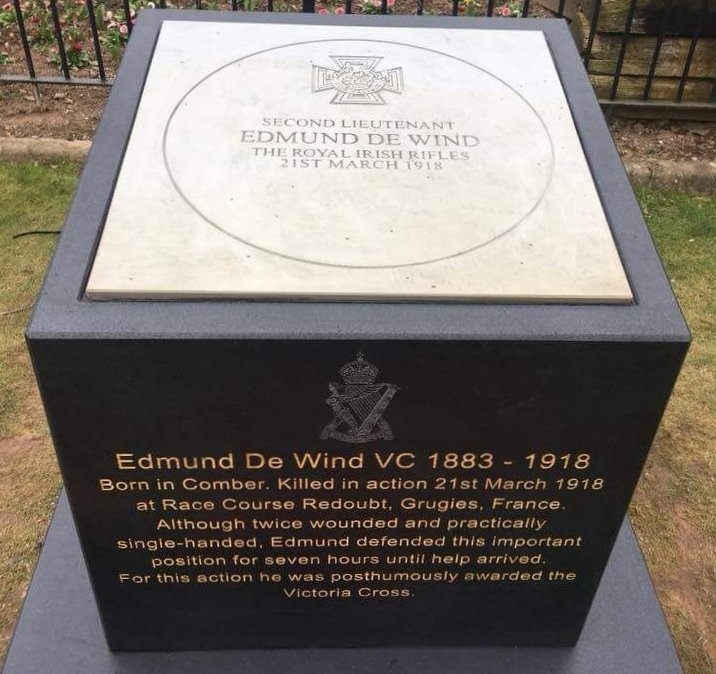 There is also a VC commemorative stone mounted on a plinth in his town of birth, Comber (right) that was dedicated on 21 March 2018, marking 100 years since his action and death.